In the year 2026, the Augma is released to the public as an alternative system to the AmuSphere, due to its function to simulate reality while the player is conscious rather than using FullDive. 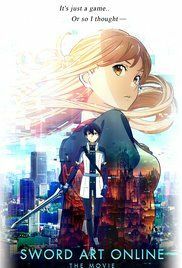 The most prominent combat-based game is Ordinal Scale, in which a player's abilities are ranked by ordinal numbers. Asuna, Lisbeth and Silica encourage Kirito to play OS upon hearing that Aincrad bosses have appeared. Kirito joins Asuna and Klein in a boss fight where the game's mascot, AI idol singer Yuna, appears and gives players buff effects as she sings. Kirito fails to achieve anything due to lack of physical strength and quickness. Eiji, the number-two player, aides the group in defeating the boss. Before Asuna makes the killing blow, Eiji whispers the word "Switch," a game mechanic from SAO that she recognizes. Read more on Wikipedia.